Beginning in 1963, the Beatles started a holiday tradition of recording Christmas messages for their fans. The recordings were edited and issued on flexi-discs through the Official Beatles Fan Club in England. The records were not available for sale, but were distributed free to Fan Club members. In 1964, Beatles (U.S.A.) Ltd., the official national Beatles fan club in the United States, began sending annual Christmas records to its members. Beatles press agent Tony Barrow came up with the concept for the Christmas records and scripted the initial efforts. This tradition continued through 1969. Because the group officially broke up in 1970, there was little point in assembling a new series of holiday greetings from the Beatles. Instead, the British and American fan clubs distributed vinyl albums containing all of the previously issued Christmas messages. Although the Christmas recordings have been bootlegged for decades, they have never been officially released to the general public until now. But rather than duplicating the thin flexi-discs originally issued by the Beatles Fan Club, Apple has pressed each of the Christmas records from 1963 through 1969 on good old fashioned thick vinyl, and colored vinyl to boot. 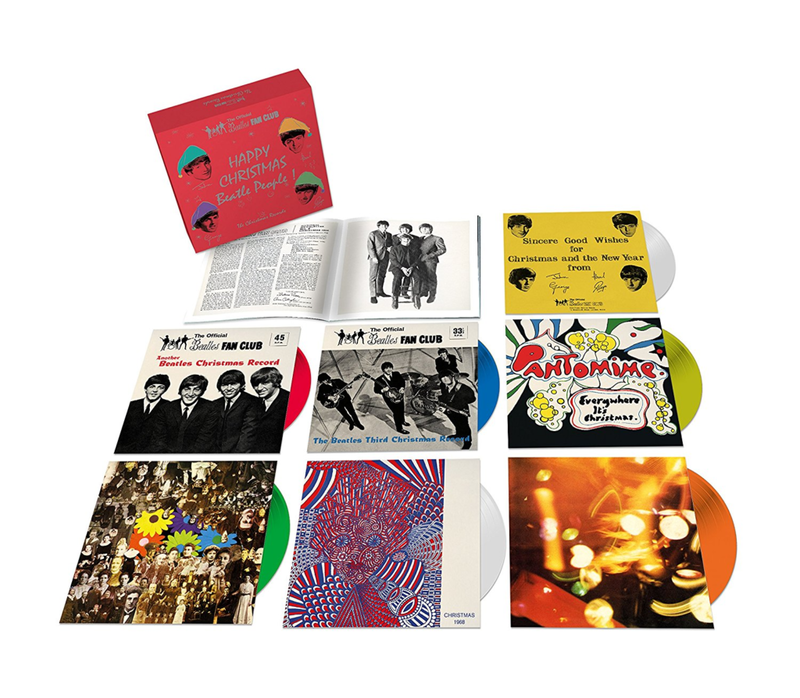 Each 7-inch disc comes in a sturdy cardboard sleeve mimicking the original sleeves from the sixties; however, the 1963 disc is not housed in a pocket sleeve as was the original Fan Club issue. Some of the later sleeves contain art provided by the Beatles: 1966-Paul; 1967-Julian Lennon, John Lennon and Ringo Starr; and 1969-Ringo and his son, Zak. The vinyl discs are also quite attractive, particularly the 1964 translucent red and the 1967 translucent green pressings. The labels duplicate the original labels from the sixties. The first five discs are one-sided, whereas the last two have recordings on both sides. The discs were mastered from the best sources available, with some of them mastered from the original contemporaneous safety copy tapes archived at Apple Corps. The others were mastered from the 1970 album master, also archived at Apple. 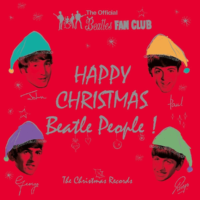 The discs are housed in red cardboard box with the message “HAPPY CHRISTMAS Beatle People!” The package comes with a 16-page booklet that includes copies of the Fan Club Newsletters from the 1963 through 1967 Christmas seasons, brief notes by Kevin Howlett and brief summaries of each disc’s content and/or recording history. All in all, a very attractive package. While these seasonal recordings are often dismissed as nonsensical ramblings from the boys, they should not be swept under the rug of Christmases past. To paraphrase Ringo’s astute observation in “Help!” after multiple attempts to steal his ring, “There’s more here than meets the ear.” Listening to the holiday tracks in chronological order demonstrates how the annual Christmas discs mirrored the ever-evolving Beatles. The 1963 recording has the Fab Four dutifully reading Tony Barrow’s script, listing the highlights of the year and thanking their fans. They also sing bits of “Good King Wenceslaus” and “Rudolph The Red Nosed Reindeer.” The disc ends with the boys wishing everyone a Merry Christmas. By late 1964, the boys, particularly John, were beginning to rebel from the image carefully crafted by manager Brian Epstein and his staff. While they thank their fans and follow a script, John injects humorous asides, changes words and mockingly lets listeners know he is reading from a prepared script. Although the disc opens with a snippet of “Jingle Bells,” its ending has the group singing “Oh can you wash your father’s shirt, oh can you wash it clean?” before shouting out “Happy Christmas” over the sound of feet running away. The 1965 message finds the lads poking fun at the concept of recording holiday messages. After opening with an out-of-tune, off-key rendition of “Yesterday,” the group eagerly agrees to follow Ringo’s suggestion to do a Christmas record. The scene is reminiscent of a typical rock movie in which someone comes up with the idea to play a song at an opportune moment. Although Paul gives the fans the usual thanks for sending presents and buying the records, John thanks the fans for pieces of chewed up gum and playing cards made of knickers. The group engages in a bit of political satire with a militarized version of “Auld Lang Syne,” complete with references to Vietnam, China and bodies floating in the River Jordan. This foreshadows John’s anti-war comments from 1966, in which he stated that if Americans could accept something as cruel as the war in Vietnam, then they could accept the gore of the butcher cover. The 1967 holiday offering follows the same format, with the Beatles, this time aided and abetted by actor Victor Spinetti, taking fans on a magical mystery tour of the BBC, complete with another original song, “Christmas Time (Is Here Again).” The disc contains a series of skits mimicking the Beeb’s radio and television programming, including a talent audition, quiz show, dramatic theater and commercial jingle for an imaginary product, Wonderlust: “Get Wonderlust for your trousers, get Wonderlust for your hair.” The group, taking on the created identity of the Ravellers, performs “Plenty Of Jam Jars,” an echo-laden, piano-backed recording with the sound and spirit of an English music hall tune. The record concludes with a nonsensical Christmas message backed by George Martin playing “Auld Lang Syne” on Hammond organ and the sound of swirling wind. The Beatles Christmas record for 1969 followed the same formula as the previous year. Rather than gathering at the studio to record a group message or story, each Beatle supplied a tape of holiday greetings, which were once again edited by Kenny Everett. John showed his admiration and devotion to Yoko by having her make significant contributions to his segments. Her prominent presence on the 1969 Christmas record signaled that John was more interested in being with Yoko than carrying on with the Beatles. When viewed in context with what was going on within the group at the time these discs were recorded, the Beatles Christmas records become more than a curiosity. They are relevant, providing an entertaining journey through the maturation and eventual break-up of the band. Thanks to Apple for making these discs available to those who were not among the lucky Fan Club members who received them for free back in the sixties.